Freemasons’ Hall is a landmark period building on Covent Garden's Great Queen Street. On the ground floor there is the Gallery Suite & Ante Room and the Old Boardroom. The Gallery Suite is a large rectangular room with a maximum capacity of 220 (theatre style, standing or for dining). The Ante Room is great for refreshments and drinks receptions. The Old Boardroom can be used as a break-out room (maximum capacity 60 seated) for meetings and conferences. Our grandest and largest spaces are on the first floor - the Grand Temple and the Vestibules and associated spaces. All hirers of the Grand Temple and/or the Vestibules have exclusive use of the Tower Doors, which lead in to The Tower Entrance and the Tower Cloakroom. From the Tower Entrance there are two stone staircases that lead up to the first floor and the Vestibules. The Vestibules have a capacity of 450 standing for parties and receptions. For dining, up to 150 can be accommodated in the middle section, and up to 250 when the third section is used as well. The first section of the Vestibules can then be used for the drinks reception. Next to the Vestibules is the Processional Corridor leading to the Past Grand Officers’ Robing Room – together these have a maximum capacity of 400. Using the Vestibules and the Processional Corridor and the Past Grand officers’ Robing Room altogether will give a maximum capacity of 850 over these spaces, plus the ground floor Tower Entrance and Tower Cloakroom. At the end of the Processional Corridor is the Grand Officers’ Robing Room with a maximum capacity of 80 seated (theatre style or at round tables) or 150 standing. Please note – if the furniture is moved out of the Past Grand Officers’ Robing Room, this room will need to be stored in this room. The Processional Corridor, the Past Grand Officers’ Robing and the Grand Officers’ Robing can be hired on their own – ideal for smaller conferences and meetings. 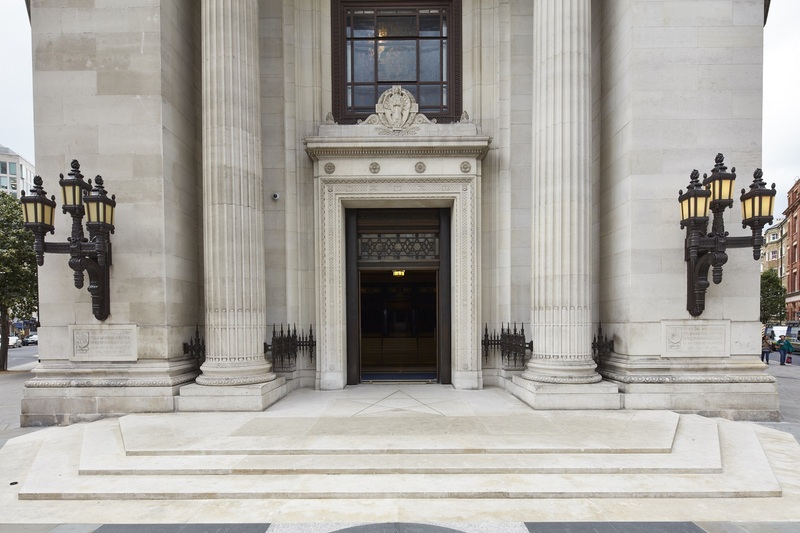 The Grand Temple – this is the largest and the grandest of our spaces at Freemasons’ Hall. There is fixed theatre style seating for up to 1,625 if all the seats are used. Using the lower level seating only (excluding the Dais seats) means a maximum capacity of 928 although the style of the layout lends itself to smaller audiences of 350 – 400 very well. With the Vestibules and the Past Grand Officers’ Robing Room, for refreshments and catering, conferences are self-contained within these spaces. Using the Gallery Suite (on the ground floor) as well as the Grand Temple will provide a breakout room for up to 220. The fixed seating can be staged over – fully or in part – to provide flat floored spaces. If fully staged over, the maximum capacity is 1,138, and if partly staged over it is approximately 500 – 600 depending on what is done. By staging over the seating the Grand Temple can be used for dining, for standing receptions or for dancing. Please note: as a Peace Memorial, we do not host weddings or civil partnership ceremonies or receptions or private birthday/celebration parties.